LONDONDERRY, Dominica, Feb 26 2014 (IPS) - When Dean, the first storm of the 2007 Atlantic hurricane season, lashed Dominica on Aug. 16, it left behind a trail of destruction, claimed the lives of a mother and son, and decimated the island’s vital banana industry. Seven years later, Dominica’s agricultural sector remains painfully vulnerable to natural disasters and climate variability. Every year, farmers lose a significant portion of their crops and livestock during the six-month hurricane season. “Our first major hurricane was Hurricane David in 1979, which ravaged the entire country. Everything went down,” former prime minister Edison James, himself a farmer, told IPS. “Since then we’ve had storms and hurricanes from time to time which have caused damage of varying extent. 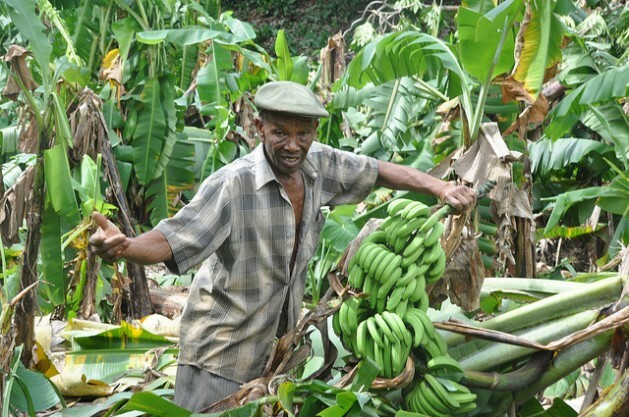 The banana industry is a valuable source of foreign exchange for several Caribbean countries, including Dominica. The island produces approximately 30,000 tonnes of the fruit annually, earning an estimated 55 million dollars. The neighbouring islands of St. Lucia and St. Vincent and the Grenadines, which together market their fruit under the Windward Islands Banana brand, earn an average of 68 million dollars. The banana industry is also the second largest employer on the island after the government, providing work for 6,000 farmers and many others within the sector. Research has found that even slight temperature increases can damage banana production or even eliminate it altogether. James, a longstanding legislator who served as prime minister from 1995-2000, has shifted to “multi-crop farming” over the last decade. But he has suffered huge losses of bananas, plantains, coconuts, okra, and other crops. He blames unpredictable rainfall, ironically in a country best known for its many rivers and abundance of water. “There has been drought from time to time and it has been very intense in areas like Woodford Hill and Londonderry,” he told IPS. A water resources specialist with the Reducing the Risks to Human and Natural Assets Resulting from Climate Change (RRACC) project in the OECS Secretariat, Rupert Lay, said the potential losses to farmers in Londonderry and Dominica as a whole are hitting across the board, a situation which is increasingly common in the region. “Climate change and variability is disrupting the modus of operation of farmers and as a result their output volumes are unpredictable and sporadic,” he told IPS. “The variations in output are wide-ranging, from bumper harvests to zero yields for respective periods, and these stressors apply not only to crops but also to livestock production,” Lay added. The World Bank reports that agriculture’s share of GDP in Dominica has fallen consistently with each major natural disaster, with the sector failing to recover previous levels of relative importance. Most of this decline is attributable to crop losses, and specifically the decline in banana production. According to World Bank figures, agricultural production accounted for 12.2 percent of total GDP, and overall the sector is estimated to have declined by 10.6 percent in 2010 on the heels of a 1.5 percent growth rate for 2009. The performance of the crops sub-sector was severely affected by the extended drought in 2010, the World Bank said, adding that agriculture’s decline has been particularly marked since Hurricane Hugo in 1989. Environment Minister Kenneth Darroux notes that for a country that could be self-sufficient and provide food to neighbouring countries, Dominica’s food imports constitute an increasing burden on the economy, and threaten food security. He called for “adaptive measures [to] build resilience to the stressors of climate change in that a farmer will be better able to maintain predicted levels of production, thus protecting expected levels of livelihoods and sustenance,” Lay told IPS. These could include better farm management, pest control, and broader agricultural improvement programmes. Prime Minister Roosevelt Skerrit said Dominica’s vulnerability to climate change is exacerbated by its present economic performance, its particular socio-economic structure and high concentration of infrastructure along the coastline. “The additional stress that climate change places on ecological and socio-economic systems is not to be underestimated,” Skerrit said. “Climate change is predicted to have severe, if not catastrophic, consequences over the short to medium term across sectors such as infrastructure, agriculture, energy, human settlements and water, if immediate action is not taken to reduce greenhouse gas (GHG) emissions 50 percent by 2050 from 1990 levels. “Climate change is clearly the greatest development challenge of the 21st century,” Skerrit said. His St. Vincent and the Grenadines counterpart, Prime Minister Dr. Ralph Gonsalves, told IPS regional countries will be pushing to strengthen their institutional arrangements to deal with the impact of climate change. Gonsalves said that the issue would be discussed at the upcoming CARICOM Inter-sessional summit in Kingstown, Mar. 10-11. “There are several dimensions to climate change [and] clearly an immediate one for us is how do we better prepare ourselves for national disasters and how do we better recover from natural disasters, and we have to look at the strengthening of our institutional arrangements against the backdrop of increased vulnerabilities arising from the frequency and intensity of natural disasters,” Gonsalves told IPS. He said this was a serious matter because “we do not contribute greatly to man-made climate change but we are on the frontline and there is lots of talk all the time about monies for adaptation and mitigation. “We haven’t seen those monies yet. There are some limited resources which come out of the World Bank but the kinds of monies which have been pledged…are yet to be delivered,” he told IPS. Gonsalves said this is a matter where the region would have to do much more coordinated work, adding “we have a lot of good allies – the British are now talking in a very serious way because of what is happening there”.